Explore Chicago » 5 Things to Do in…Grant Park! 5 Things to Do in…Grant Park! From Buckingham Fountain to world class festivals and events like Taste of Chicago and Chicago SummerDance, there’s so much to do in and around Grant Park! Grab a Taste of Chicago: If you’re ready to loosen your belt a notch, sample food from 59 restaurants at the annual Taste of Chicago festival held each year in Grant Park. Enjoy free concerts by Loretta Lynn, Natalie Cole, the Jayhawks & others as well as family activities and performances, June 24 – July 3, 2011. Feel the mist from Buckingham Fountain: From its stunning spout of cool water 150 feet in the air (every hour on the hour, for twenty minutes) to its nighttime light displays, there’s always a reason to stop and marvel at this Chicago icon just a few feet from Lake Shore Drive and Lake Michigan. Admire some creative recycling: Did you know Grant Park was in part built on top of the trash remains of the 1871 Great Chicago Fire? In 1901 when Grant Park was built, it was on top of land that previously had not existed before the City decided to keep the area next to Lake Michigan free for public use. In 1909, urban planner Daniel Burnham wrote in his Plan for Chicago that “the lakefront by right belongs to the people” and now residents and tourists alike can stroll among the lakefront park’s greenery. Join a Soul Train dance line at Chicago SummerDance in Grant Park’s Spirit of Music Garden: Try out your best moves, July 7 – September 18, when Chicago SummerDance hosts over 40 engaging live bands and offers free dance lessons, every Thursday – Sunday night. From Soul Train’s 40th Anniversary on July 23 to the Latin Street Salsa Congress on August 17 and 21, there are a lot of dance and music styles to choose from! Artist Dan Peterman created Chicago SummerDance’s 4900 square foot open-air dance floor for out of recycled plastic, continuing Grant Park’s legacy of creative recycling. Lounge by La Grande Jatte: Pop into the Art Institute of Chicago, located on Michigan Avenue on the west side of Grant Park, and explore one of the city’s richest art museums. It houses not only “A Sunday on La Grande Jatte” by Georges Seurat, but also Grant Wood’s “American Gothic”, paintings by Monet, Renoir, and Picasso, along with a newly completed Modern Wing of contemporary art from around the world. Have little ones in tow? 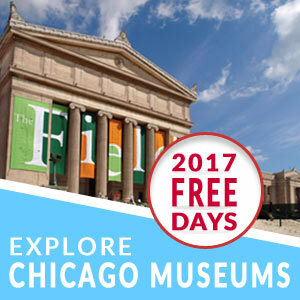 The Art Institute of Chicago is always free for kids 14 and under! Drop into the Ryan Education Center in the Modern Wing for hands-on activities and exhibitions. Learn the blues with a smile: Bustle into Buddy Guy’s Legends and groove to blues music over cocktails. If you’re lucky enough to be there when Buddy’s in town, you might just see the legend himself take the stage. If not, be sure to expect the best in blues music from its Sweet Home, Chicago. For more information on neighborhood, including detailed attractions, shopping, and dining listings, check out our printable neighborhood guide and interactive Google map.